On average, there are 51,000 home fires involving electrical distribution reported each year in the USA. These fires result in 500 deaths a year. 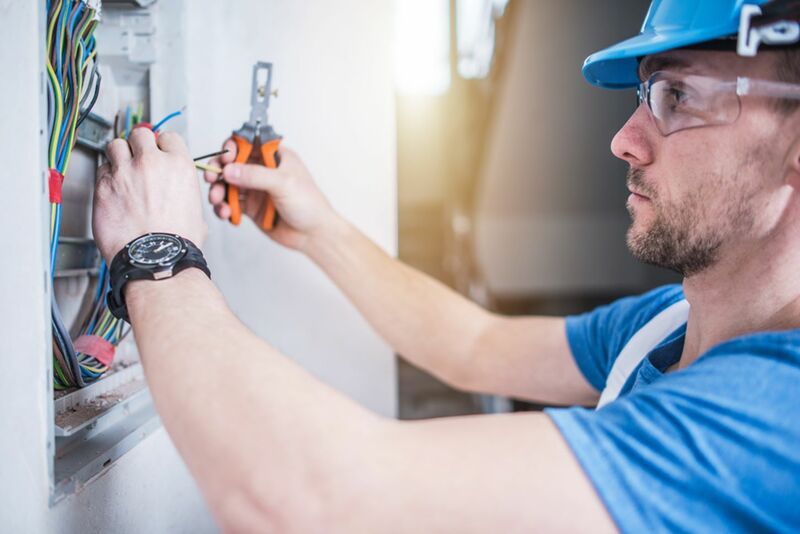 As a result, the Electrical Safety Foundation International recommends that electrical work in the home is done by a properly qualified electrician. Are you concerned that your home may have faulty wiring? Have you considered the safety implications of electrical problems? Read on to learn about 8 signs that you should schedule an electrical inspection. Flicking or dimming of lighting fixtures during normal use is rarely due to a fault in the fixture. It is more likely to be caused by other appliances attached to the same circuit. An energy-hungry appliance like a heater or washing machine can draw a lot of power. Call an electrician to test the appliance and the circuit. They may be able to move the lighting to a different circuit. They can also ensure that the heavy-duty appliances have the right power supply and protection. When you use a new appliance, there can sometimes be a little smell as light oil or duct is burned off. This should not take long, and if it continues, there may be a fault. If there is a smell of burning around any electrical outlets or from a fuse box, this is a sign of problems. Stop using the power. Call an electrician to inspect it. Any heat coming from your electrical wiring, switches or outlets should be a matter of concern. Keep monitoring any warm spots in case the temperature rises. A steady warm socket is probably ok, but if it becomes hot, have it checked. Even high-power devices such as heaters should not have excessive heat coming for the electrical supply. Try the device in another outlet. If it does not get hot in an alternative outlet, get the original outlet checked out. An outlet that gets warm even if there is no electrical device attached may have a wiring problem. Don't use it and have it checked. Fuses and circuit breakers are designed to protect your appliances and your home. They blow or trip whenever the load is too high. This prevents an overload and may protect against damage or even a fire. If your circuit breakers regularly trip when you use a particular appliance, the appliance may be faulty. If the circuit breaker trips when you use a specific outlet, then it may be that this part of the circuit is overloaded. Seek advice from an electrician about an upgrade for the circuit or an additional circuit. There should not be any noise produced by your electrical circuit. It is not normal to have an electrical buzz or humming noise. This could be caused by loose connections, faulty wiring or defective appliances. If you can detect the source of a strange noise stop using the appliance, outlet or circuit. Seek the help of an electrician to diagnose the fault and resolve the problem. Not all electrical outlets are the same. Rooms that have water supplies such as bathrooms and kitchens need a different type of electrical outlet to your other rooms. This is because water is an excellent conductor of electricity and therefore can be dangerous if there is a fault. The special outlets are called ground fault circuit interrupters (GFCIs). They are recognizable because they have two buttons in the middle. If your kitchen or bathroom outlets look identical to the other ones around your home, then you should have them checked and perhaps replaced by a professional electrician. Any sparks that appear when you use electricity in your home are a potential fire hazard. Don't accept any level of sparking as normal. Any sparks from the house electrical system such as an outlet or fuse box should be checked by an electrician. Any sparks from an appliance may mean that the appliance needs checking. It may need a repair, which could be covered by the appliance's warranty if it has one. Lots of extension cords suggest that there are insufficient electrical outlets. Similarly, having many appliances running from a single multi-socket suggests that you don't have enough outlets. Extension cords can be a useful way of temporarily providing power to an appliance where there is no convenient outlet. It is not the safest way of doing this in the long run. An extension cord introduces the added risks of poor connection, twisted cords, and electrical shorting. An extension cord can get in the way and cause trips and falls. It might be time to have an electrician review your electrical system. Perhaps you need some additional electrical outlets. All of the above issues should suggest that an electrical inspection is needed. They can occur at any time. There are some particular times when you should consider having an electrician check for wiring problems. When buying a house, you should consider having the whole house checked for any electrical faults. This is especially important in an older house if the electrical wiring has not been recently replaced by a qualified electrician. If you are considering a major renovation project in your home, consider having an inspection to look for any signs of electrical problems. This might be the best time to have improvements to the system completed. Take the opportunity to have an electrical inspection when you will already be having some disruptive home improvement work done. To contact an electrician, click here.